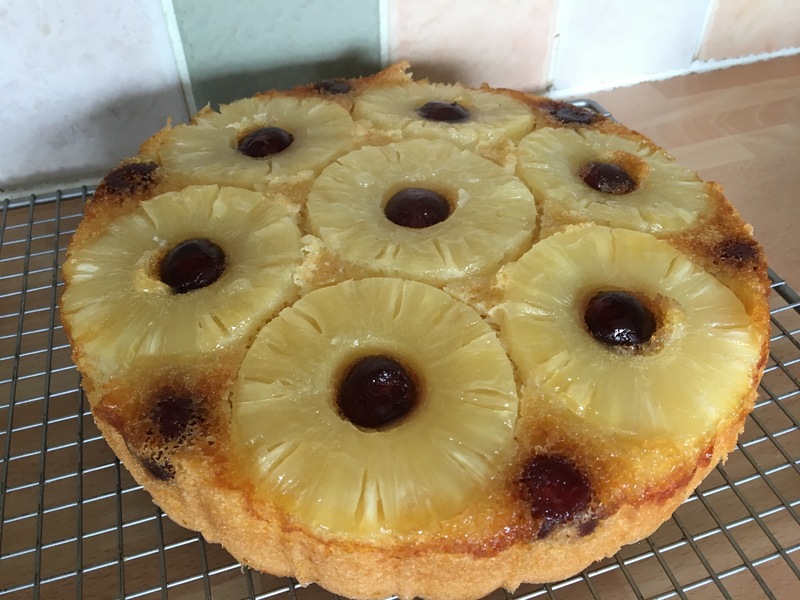 Who remembers having Pineapple Upside Down Cake as a child? Did you have it for school dinners? I did, although when I was little I didn’t like the pineapple and left it. I remember a very strict teacher at our Infant School telling me off for not eating it and making me sit there at the table until I’d eaten every last mouthful! I’m surprised it hasn’t put me off pineapple for life! I’ve had the NordicWare Pineapple Upside Down Bundt pan for a couple of years now. I spotted it on Ebay from the US and just HAD TO HAVE IT! 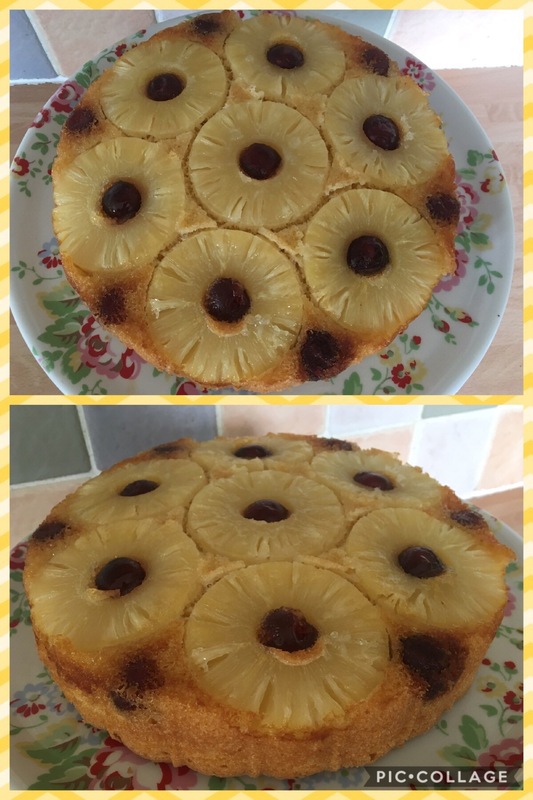 I love how you already have the shape of where to stick the pineapple rings and the cherries in. 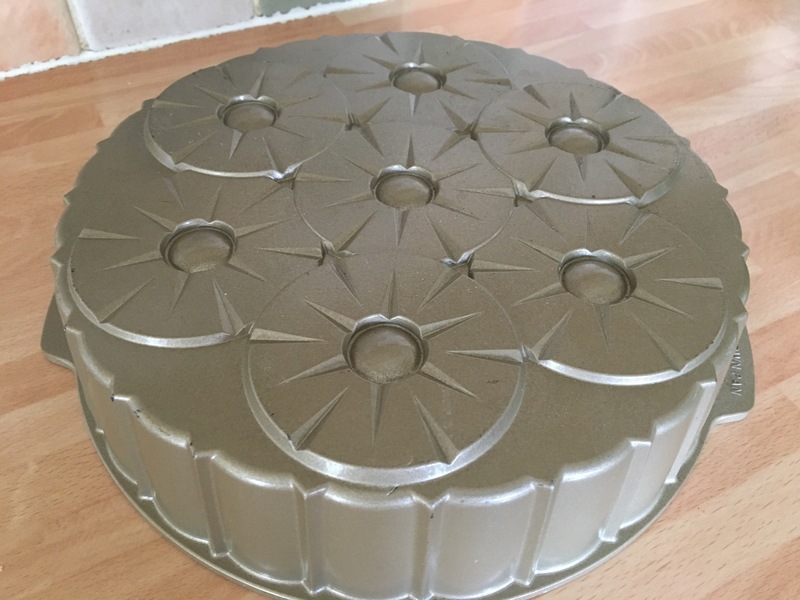 Alternatively as with other bundt pans, you could bake a pineapple flavoured cake and the pretty pattern will come out on top of the cake when you take it out of the tin. Personally, I’ve not got round to trying this out yet, but maybe one day? To be honest I’ve not had much chance for blogging recently so this cake was baked over a month ago. It was my 19 year old daughter’s last day at home before going back to uni for her second year. She was moving into a new house and would be going back early to work on a film shoot. As with the last year before she left for uni we had a family meal at our house. My Dad and step mum came over and I cooked a roast chicken dinner followed by either Pistachio and White Chocolate Blondies and the Pineapple Upside Down Cake. What would you serve with it? I went for a choice of double cream or vanilla ice cream. As for the recipe used, I tried googling for a recipe specifically for the Nordicware pan but could I find one? No such luck, so I tried adapting a recipe I’ve used before. Nigella Lawson has a lovely recipe in her Express book, but the cake comes out a lot smaller. I doubled the quantities of the cake mixture itself and that seemed to work. I had to keep an eye on the time in the oven though. As it was over a month ago I can’t remember the exact time but my guess is it took me about an hour to bake. The bundt pan has been greased in the usual way. I put the cherries and the pineapples in the right places and then sprinkled sugar on the top of them to help make them caramelise. The finished Pineapple Upside Down Cake. It was perfect for a Sunday lunch dessert. Previous Post Spaghetti Carbonara- Midweek Meal. Next Post Spiced Dorset Apple Traybake.